This article is part of an ongoing case study covering book promotion and marketing. A previous article covers the 4 questions you should ask yourself before making a decision to write a book. Who Will Benefit From This Case Study? Executives, corporate individuals, teachers, consultants, freelancers, and entrepreneurs, and anyone interested in launching a non-fiction book. If you are a new author trying to crack the code in the Amazon ratings game or navigating the path to author stardom, you are in the good company of many other writers who are testing and succeeding their way to book launch. As a first time author, I’ve learned a lot about writing and launching my prized possession, yet humbly state my indie journey has just begun. Even if you are not an indie author, and have obtained book deals from major publishing houses, this blog post may benefit you in the area of marketing, PR, and promotion. Regardless of your status, authors of all types are increasingly responsible for the market success of their books. 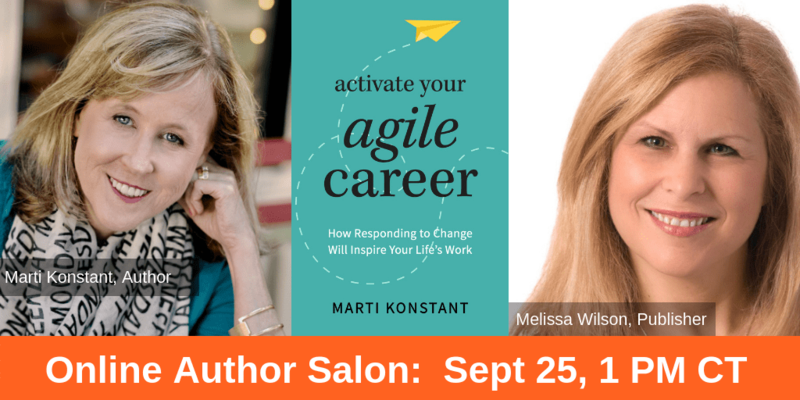 After finalizing my book Activate Your Agile Career: How Responding to Change Will Inspire Your Life’s Work, we published via Amazon Kindle (KDP) and Paperback (via CreateSpace). Because there was so much to do and learn, I focused on Amazon as my distribution partner where most books are sold. Give yourself permission to keep it simple. For example, I deferred the Audible version of my book for a later time. Recording a book is a lot of work, and I did not want to delay the launch schedule. Now let’s dive in to the seven steps. Establish a baseline of multi-channel marketing activities to sell 5000 books in one year. You can claim Amazon best-seller status on the next printing of your book. You may experience momentum and credibility for building your business. As you promote the milestones, your community, partners, customers, and potential customers will notice and may even start cheering you forward. However, if you only have time and budget for a page, consider Leadpages for your author page. Include the book, about you, your services, press information, and how to contact you. Note that you will not be able to create blog posts in a Leadpages environment, but at least you will have a place to do business. Blogging within my WordPress site is a key content marketing strategy to establish community and build thought leadership for career agility. These articles can be reached via organic search (good) or via an email newsletter (even better). Guest blogging or guest podcasting is another option you should consider and set up a plan around to introduce new readers and potential customers to your ideas. Don’t have a blog? Use the LinkedIn Pulse Network or Medium to start producing content to generate awareness for your topic and your business. Three weeks before the publish date, I created a list of 700 potential newsletter subscribers by analyzing people from my LinkedIn network. Because a mass email asking them to subscribe to my fantastic newsletter seemed impersonal, I emailed each person separately, customizing each message. I also felt a mass email would not get the desired ROI. With this effort, I was able to register almost 300 subscribers in time for the book debut on the Amazon publish date. The intention is to release a newsletter every week with a custom intro, link to latest blog post, and a curated group of 2-3 relevant article links. NOTE FROM MELISSA: Realize that Marti’s approach is so counterintuitive from what most people would think. 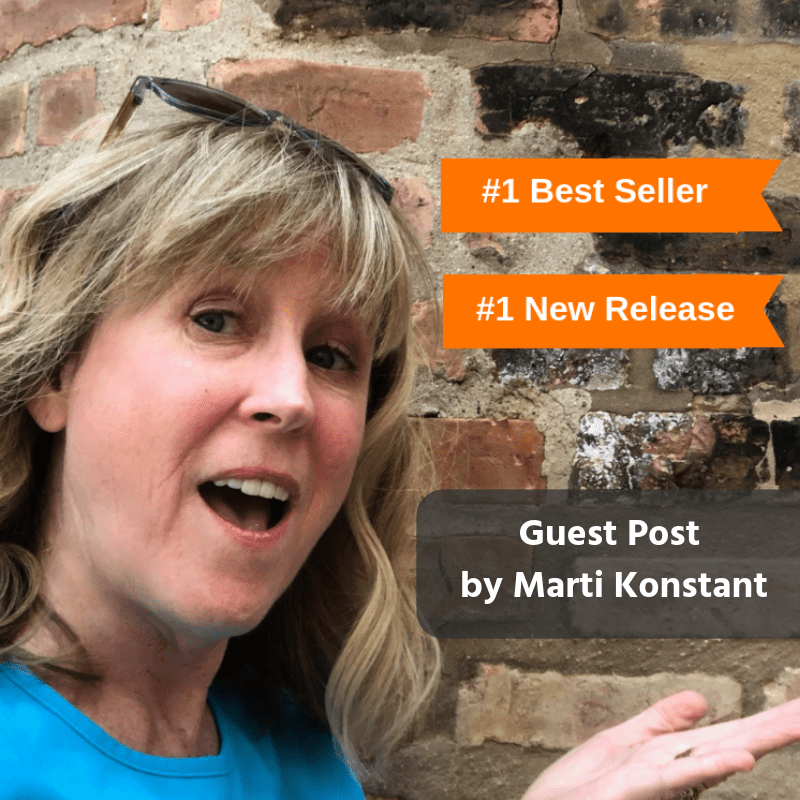 It’s what I would state is all about “quality producing quantity.” In other words, Marti’s initial one-by-one, personal outreach to other professionals (as her book is a non-fiction self-help book), became the catalyst to creating the groundswell she needed to get the results she got launching her book. I don’t know about you, but there is limited capacity to be active on all social channels. I chose Twitter, LinkedIn, and Instagram. The main point on social is to engage, along with promoting your brand. Too much broadcasting about how wonderful you are can have negative consequences. Some authors hire social community managers to handle their social media calendar. The goal of media outreach is to generate media interest, byline articles, guest blogs, guest podcast opportunities, and speaking engagements. 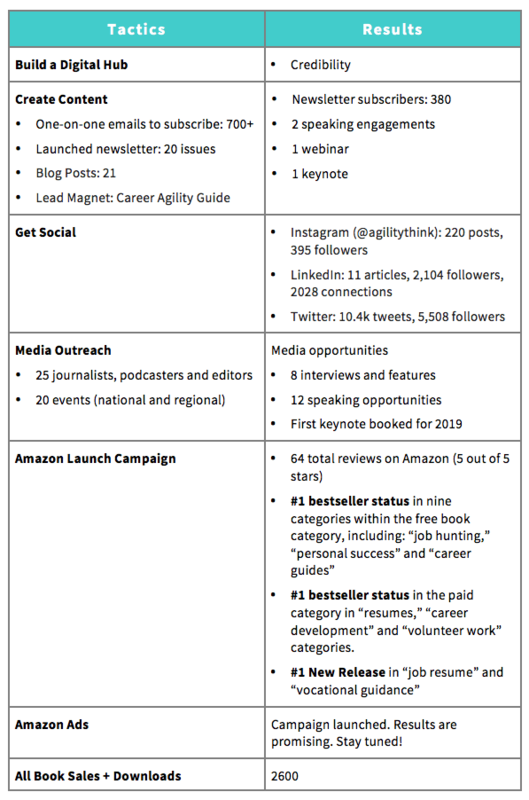 With the help of a freelancer, we booked some activities prior to the actual book launch, but most of my activities are pouring in, now that I am an author! As an example, I just booked my first Keynote speech for January 2019. This was booked three months after my publication date. We planted a lot of seeds, establishing an awareness-activity pipeline, yet it takes months to turn into results. Our goal was to obtain Amazon best-seller status, accompanied by the bright orange ribbons, indicating best seller or #1 New Release. You’re probably wondering at this point, how one person accomplishes all of these activities. The answer is freelancers. If you don’t have a budget for this type of help, the option is to scale back on some of the activities. My rationale for hiring freelancers was you only get one chance to take advantage of kick-starting your program and establish momentum. In advance of launch day, we assembled a launch squad to pre-order the book(friends, family, business acquaintances). The launch squad was offered advanced electronic copies of the book to prepare their book reviews. When it comes to ranking on Amazon, we knew verified Amazon reviews (official purchase of the book on Amazon, followed by a review) was pivotal. 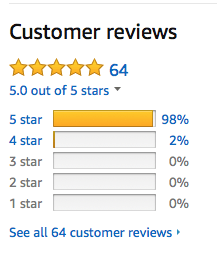 Other non-verified reviews are helpful, but verified reviews have a bigger impact on the Amazon algorithm. We worked with the launch squad to ensure verified reviews were posted on my publishing day. 50+ reviews were posted within 24 hours. This was an important step to engage Happy Self Publishing (HSP), a paid book promotion partner. We also worked with HSP on the 7-day promotional plan to advertise the book through dozens of websites and social media groups to increase visibility and downloads during launch week. Since working with algorithms and optimizing categories was out of my comfort zone. the HSP team adjusted categories on the back end of Amazon to achieve best-seller rankings. Once verified reviews were posted on Amazon by the launch squad, the HSP team activated a cross-promotional program with various book websites in combination with the Amazon 7-Day Kindle Countdown. The countdown is a feature of the Kindle Direct Publishing (KDP) Select program and included a combination of free downloads and 99 cent download days. This promo offered free or discounted downloads to thousands of readers. Ads are another way to keep the momentum going. Similar to the way Facebook ads were fairly successful in the early days, many people feel Amazon ads will have that same success in the next year or two. I am in the middle of optimizing the best performing ads in preparation for a longer-term campaign. Early results are promising. Stay tuned for longer-term outcomes. The tactics and results are listed in the table below. Publicize successes (and failures!) across all communication outlets. Be honest and authentic. One-to-one outreach and working with your network trumps cold calling. Get the right team behind you. Work with freelancers and project experts along the way. Like any marketing effort, results are not achieved by one activity. They are achieved by an integrated approach. Awareness was achieved through efforts started long before the official launch. My Amazon results were only accomplished through a community effort of participants and committed launch squad. There are also other details that impact the success of your book. Your topic, the quality of your content, the endorsements listed inside your book or on the back cover, professional copy editing, and proofing are just a few.